“Leadership in an environment of complexity will be that person who facilitates and creates an environment which makes it possible for the elements within the system to interact and create new forms of reality, guided by the overarching vision and rules.” Keene (2000)… “the ability to listen, communicate and participate in dialog which allows groups to surface and understand their assumptions about each other and their notion of reality as opposed to that of others.” Facilitative leadership provides an opening for a complex set of viewpoints to flourish. I’m fortunate to have had the opportunity to support the facilitative leadership of Rene Castro, Hub Manager a collaborative change initiative working to improve health outcomes (Building Healthy Communities Long Beach, funded by the California Endowment). I was invited by a Rene to help facilitate a ten-month community planning process to develop new three-year goals for BHC Long Beach. Collaboration itself adds an added layer of complexity as multiple organizations with different cultures and priorities met on a regular basis to find common ground. 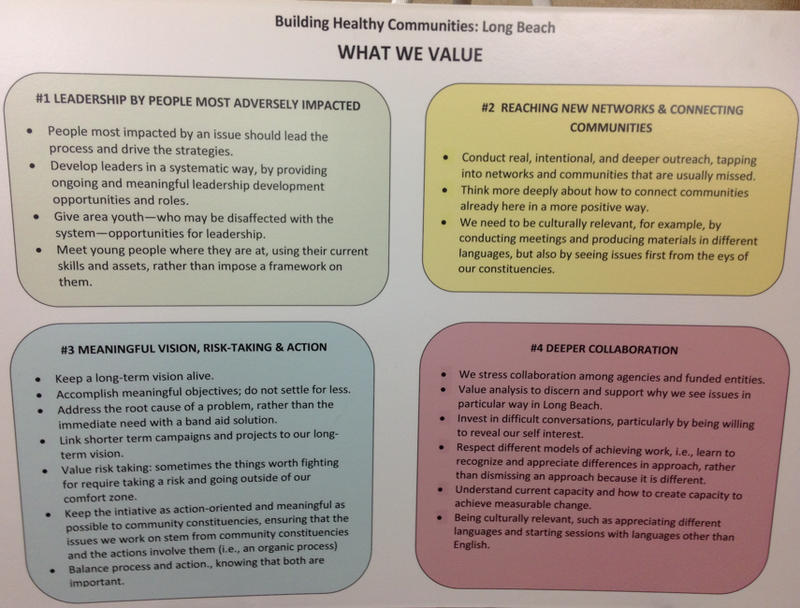 Rene and members of BHC Long Beach nurtured an environment where members of the collaboration co-created its future using values they developed in an earlier planning process as a guide. Working together, Rene and I served as facilitators of the planning process, which consisted of monthly meetings for different work groups. Together with members of the collaborative, we designed a decision-making process and clarified what decisions needed to be made. 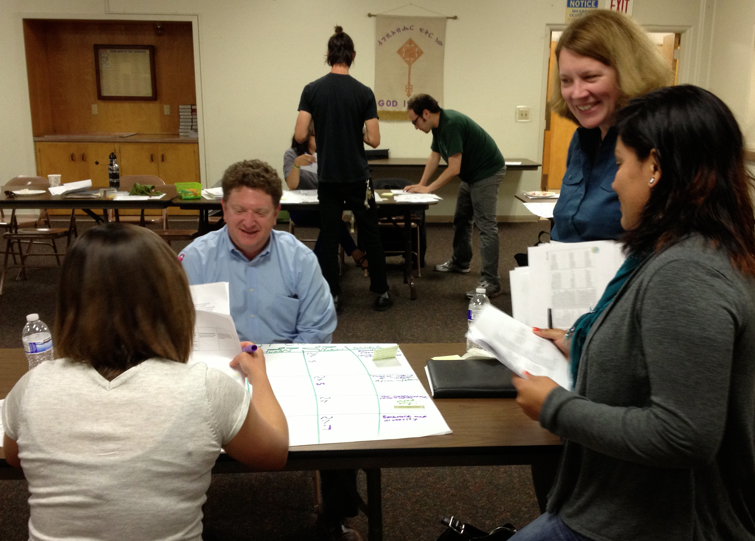 We helped groups understand their assumptions about each other through relationship building at each gathering. We also designed an engaging process that mixed large group dialog with small group conversations in a variety of formats. 1. Leadership by people most adversely impacted: Throughout the planning process, the decision-makers met this criteria and the organizations they represented primarily included people impacted by the issues the collaboration addressed. 2. Reaching new networks and connecting communities: The final goals chosen all served as strategies to build a stronger, healthier community. 3. Meaningful vision, risk taking and action: The goals chosen represented some risk taking for the collaborative. For each goal, they developed a detailed action plan. 4. Deeper collaboration: The entire process strengthened relationships and created investment in working to ensure the goals would be implemented. Each of these values served as guide posts for the collaboration to self-govern and prioritize a set of goals moving forward. We helped keep these values in front of participants throughout the process and referred to them at various meetings. This included writing the values down on flip chart paper for all to see along with more detailed handouts. Towards the end of the planning process once the group had prioritized potential set of goals for moving forward, we spent an entire meeting asking whether or not each of their potential goals met one of the collaboration’s existing values. We facilitated this process using a modified “World Cafe” process, which gave all participants the opportunity to review and refine the goals developed. This helped strengthen the collaboration because in addition to each group seeing some of their own goals vetted by the larger group, they too had the opportunity to shape goals championed by other organizations. Not all the ideas met all of the criteria, but because participants jointly agreed on the criteria, they understood the process served them to pick the right set of goals. 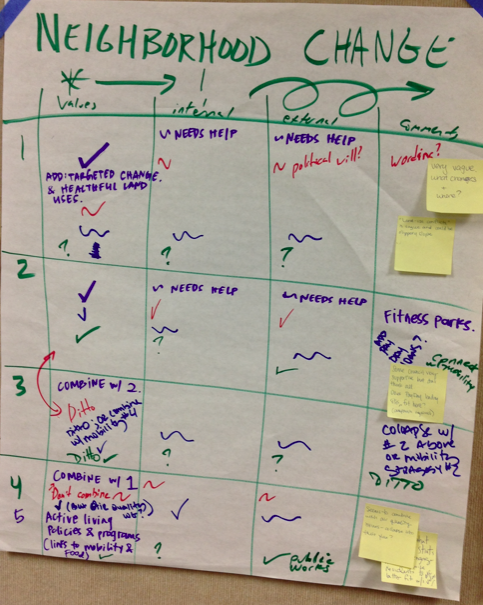 Ultimately, participants prioritized a set of goals that met each of the values criteria. The planning process also reflected their values, putting them into practice. The complexity lens gave me additional appreciation for the role facilitation plays in creating an engaging process that nurtures an environment of co-creation. While the external environment continually shifts, an additional layer of complexity exists for collaboration by having perspectives of multiple organizations in the same room. Values serve as that guidepost to inform decision-making at all levels of the organization (or in the case of my example, a collaboration among organizations). If an organization and collaboration can find and follow their values and engage its members to use these values as criteria in their decision-making, then organizations are more likely to thrive in a chaotic environment. Given the multitude of information bombarded to and from participants in the process of collaborating for change, special effort is needed to ensure values stay at the forefront. If not championed by a facilitative leader, essential direction setting values could vanish into the background. Leadership needs to include time on the meeting agenda to bring values to the forefront. Framing collaboration as a complex system helps my understanding of how fluid it can be working with various organizations on the same issue. There are multiple points of influence, each with a different perspective on reality. Attempting to control collaboration as if it were a traditional hierarchical organization will not work. The facilitator doesn’t have formal control, but does have a major influence along with all of the other players. Even if someone works full time in the role of a facilitator for a collaboration, they still won’t have a total understanding of the complexity they serve. 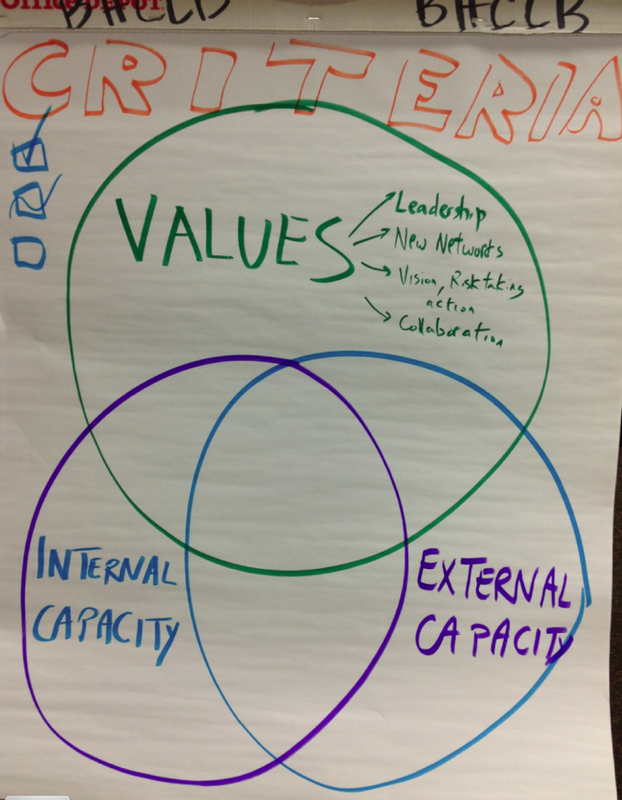 What facilitative leaders can be certain about is the role they can play in creating a space for participants to move forward using values as a guide. Block, P. (2001) The Answer to How is Yes. San Francisco. Berret-Kohler. Dolan, S., Shaw, P., & Stacey, R. (1999). Knowing and Acting in Conditions of Uncertainty: A Complexity Perspective. Systemic Practice and Action Research, 12, 3, 295-309. Keene, A. (2000). Complexity Theory: The Changing Role of Leadership. Industrial and Commercial Training, 32, 1, 15-19. This entry was posted in Collaboration and tagged #Nonprofit, #NPLA, Clients, Collaboration, Community, Facilitation, Leadership, Leadership Development, Sustainability. Bookmark the permalink.